My New wallpaper is with Christmas thematic. This is my third wallpaper for Christmas*. This time with original art by one of my most favorite illustrator, 白亜右月 (Ugetsu Hakua). I wanted this wallpaper with simple look, but at the same time not too boring. 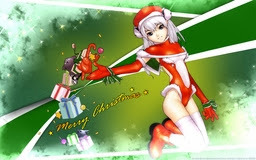 I tried to make a good contrast between the Santa Girl an the background, so I decided for green background. On the sides I have make a freeze effect (I hope it looks like freeze :P). I hope you will like it. This is probably my last wallpaper for the year 2013 (but I started to work on new one), so in the case I don't post nothing new I wish you Merry Christmas & Happy New Year.